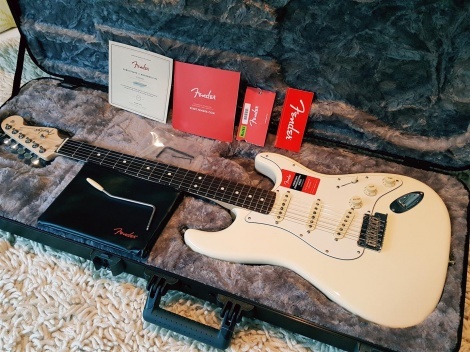 Brand new Fender 2017 American Professional Stratocaster - Olympic White. Unplayed, still in a box, not been a demo. The Stratocaster is arguably the world's most-loved electric guitar. Electrifying the music world since its debut in 1954, its natural, versatile sound made the Stratocaster the benchmark for exceptional tones. The American Professional Stratocaster isn't a re-imagining of the classic design; it's the authentic original model, evolved. The treble-bleed circuit maintains the high end when turning down the volume knob to reduce gain, letting your tone shine through, no matter where the volume is set. V-Mod Stratocaster pickups are engineered using a proprietary blend of alnico magnet types for the neck and middle pickups. Each pickup is voiced specifically for its position, creating high-output tone with vintage warmth and the crisp, clear sound.